New information as to Donor trucks - General Discussion - Drive On Wood! Hello Irvin and welcome to the site . I think you will be good with those models and years . If I am hyway driving and using for transportation I prefer the dakota but if I have work to do the 1500 would be better . Could you possibly build an older van with a ford 302 v8? Just curious. I was exploring the idea of Mobile living, like vans and such, but I am not planning to do any of it, I just want some insight on what would go into it. Another idea, probably not practical, but making a plywood or fiberglass camper shell for the Dakota, but forming it around the gasifier, and inside have a sealed hatch to load wood, and have ample ventilation for possible lingering gases. I am aware that the weight and aerodynamics would by substantially thrown off, but I am just looking at the possibilities, and something to think about. 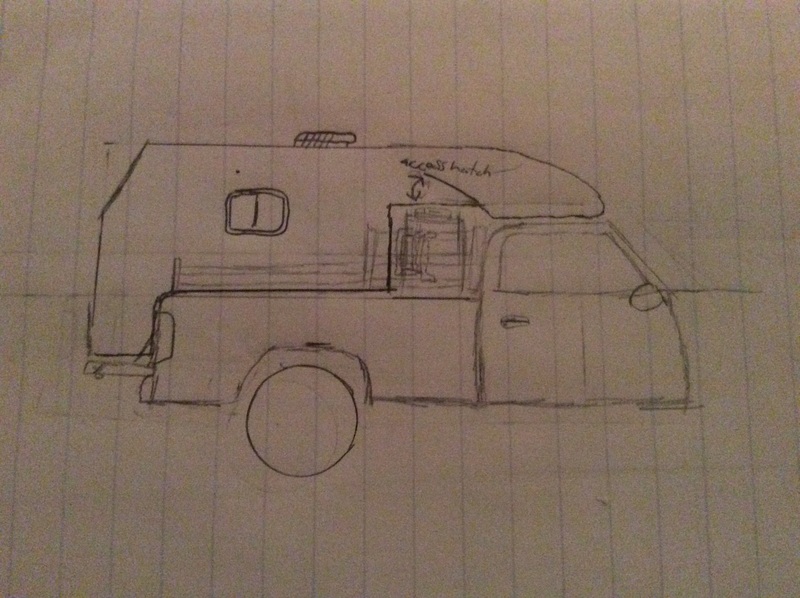 Here is a sketch to represent this so called wood gas accessible camper. If the 302 ford has a carb it can be difficult to clean the intake manifold . The sketch as you have it drawn not a good idea. Camper shells and gasifier don’t go together . A better combination would be a gasified truck pulling a small camper trailer or a camper pulling a trailer mounted gasifier . I was thinking the truck and camper trailer as well the other benefit is you can park the camper at a camp ground and drive around in the truck looking for more wood. Tyler, You mentioned Van in your post. Although uncommon, and the builder must be constantly aware of the real CO hazard, it has been done. Here is an enjoyable epic video presented by wood-gasser John Stout. The van portion enters at about 11:00 in the video. I am watching the whole video again today. Extreme Creativity Alert!! Happy Easter! So an EFI truck works best, then you consider weight and highway speed. I know Wayne likes the Dakota, would a Ford EFI 5.0 in a full size truck just be slower and use more wood? Are there more negatives like room under the bed? How about a full size Dodge with a 318? Would a 22" firetube make that feasible? Any guide lines as to year models would be helpful. Looking forward to meeting you guys at Argos, not long off now. Which days should I plan to be there? Looking forward to meeting you guys at Argos, not long off now. Which days should I plan to be there? Irvin, Folks will be arriving Wednesday afternoon through Thursday morning mostly. Expect Thursday, Friday and Saturday to be full days. Sunday is mostly clean-up and go home time. The fairgrounds will be empty before 10am, Sunday. So plan accordingly! Thanks, Al. Looks like you are a bit of a streetrodder with the cool '48. 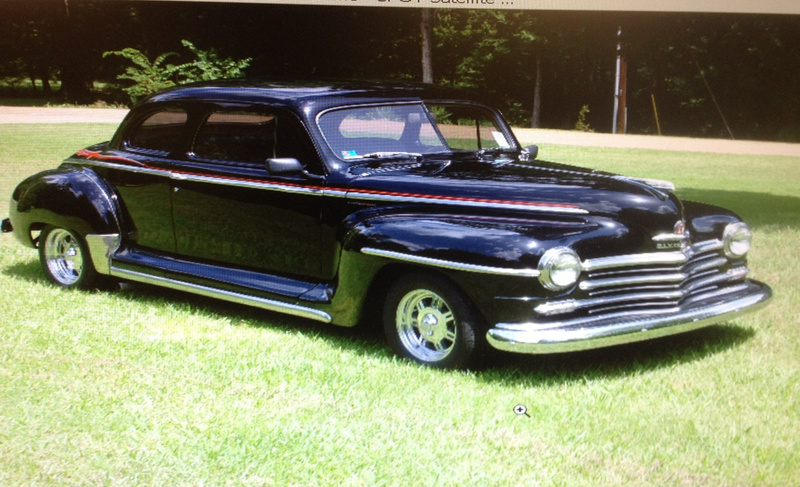 I have a '48 Plymouth Club Coupe that I take to Louisville to the Street Rod Nationals. The slid in unit appeals to me. I would like to use my '69 Chev pickup but it has a 350 carb motor (700r4) in it. Might still consider that since I could just pull the intake and have another clean one ready. Maybe too much. Most will be camping on the property, Some “camping” inside the large building. There are RV electric connections available, $15 per night to the fairgrounds. Plenty of water, nice restrooms, showers available. Works out great, stay up late and rise early. Plenty with “Jet Lag” to visit with! There are motels in Plymouth and Rochester, Indiana. I think the 5.0 would be good in a small pick-up, but a little under powered in a full size. I may put a 5.0 in my ranger some day. I may put a 5.0 in my ranger some day. Whew! Would you change the trans and diff along with the engine? Could you get by with just motor mounts, or would you have to mod the frame? Would this be a towing rig? Have you heard of anyone running the I6 300 on woodgas? My favorite engine. I thought of making an adapter plate to use the 5 spd trans that’s in it. Mounts shouldn’t be that big of a deal. There have been a few 300s on wood gas, two that comes to mind is Patrick Johnson’s sawmill, and Ron Lemley’s old Ford truck. Here is a good article that Chris wrote. I think the main decision is if one needs a work vehicle or a vehicle for personal transportation . If you choose a bigger heavier truck the hyway speed will be 10-15 mph less than a big motor small truck. My little dakota does good on the road . I have driven 800 miles in 16 hours . This includes fuel stops , stopping at rest stops , meals , pulling a small trailer and so on. In the last couple of weeks I have been experimenting with using some of my used oil in the gasifier . I pour about a gallon of oil on 100 pound of wood and let it soak in . There are so many variables that it is hard to tell if I am getting more power or millage but sofar I am seeing no negatives and it seems to be the cleanest way to deal with the used oil. It will be great getting to meet you at Argos. The first woodgasing I did was fords ( 400 , 390 and 460 ) but no woodgasing ot the 300. I did have a 300 6 in a bull dozer for a while .back in the late 70s. With the low energy and slow burning rate of woodgas there is no substitute for cubic inch displacement. I try to get the biggest motor I can get .